The night is cold and dark. It’s hard to see where you are or where you’ve been. “A road trip gone awry” is a charitable description of the world you and your friends find yourself trapped in. No one will ever believe you. This kind of stuff only happens in movies, Right? Well, tell that to the man with the axe whose been stalking you. Tell that to your friend who had to dodge his blade, or maybe that was just a mage messing with your mind. In Nyctophobia, you will attempt to outrun and outsmart an axe murderer or mage who is hunting you. Player’s must blindly navigate it, all while trying to find their car and get out of the forest alive. A team of up to 4 players will wear blackout glasses and try and take on the single player taking on the role of the hunter. The Twist? Only the Hunter can see what’s going on around them. The Hunted players will have the navigate the board through touch and memory only! Welcome to the experiential table top game that is going to redefine what it means to play a game. Nyctophobia, which means "fear of the dark", is a cooperative game of survival in which up to four players must work together to escape a maniacal predator chasing them in a pitch-black forest. But there's a wrinkle: Would-be survivors play the game with blackout glasses. Players cannot see the board and have to rely on touch to navigate their way to safety. So, are you afraid of the dark? Nyctophobia includes two versions of the Hunter that you can use: the axe murderer and the mage. 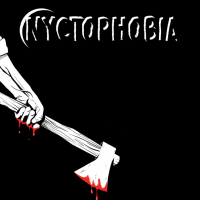 The axe murderer is stalking you and your friends in the forest, plodding forward without care or thought, chopping down the trees that separate you to get to you all the quicker; this is the most basic and carnal of all of the experiences you can encounter in Nyctophobia. The mage, by contrast, is a trickster. It's not enough for the mage to hunt her victims. Messing with their mind, manipulating the forest around them, and leaving the blind opponents more lost than when she found them is her aim. The mage can rotate the map, move trees around the forest, and generally confuse the players. Add a Review for "Nyctophobia: The Hunted"